11 entries categorized "Geek of Science"
I just learned of an excellent website, Social Explorer, that generates zoomable demographic maps of many types based upon 2000 U.S. Census data as well as earlier data. It's quite telling to look at the distribution of the black population throughout the United States, for example, or to zoom in and get a close look at how much segregation still exists in your favorite city. Or see where Swedish immigrants are concentrated. Or which counties have the highest concentration of health care workers. There are also a few slide shows available, like the black population of New York City from 1910 to 2000. There is so much to explore that I could really lose a whole afternoon there if I'm not careful. Below, the density of people holding PhD degrees in and around Boston. The darkest color on this map represents 15-25% of the population. The fantastic website Astronomy Picture of the Day features a new astronomy-related picture every single day of the year, with short, informative descriptions written by astronomers. I love these pictures. From the awe-inspiring galaxy-scapes of the Hubble Deep Field camera to remarkable images taken much closer to home like this picture of Saturn, every day APOD highlights something wondrous and beautiful in the universe. The pictures often make me feel very small, and raise in my mind profound questions that have no answer. And on top of that, they are just very pretty to look at. This picture is a view of the dark side of Saturn (the sun is eclipsed) taken by the Cassini solar system probe. Saturn's breathtaking rings are thrown into sharp relief. If you click on the image you can visit the APOD site and read the description there; you will also see a larger version of the picture in which our own planet is visible as a tiny dot of light in the background. My language and linguistics hero, Geoff Pullum, reports an astute observation one of his readers made regarding the discussion over whether to change the status of the celestial object known as Pluto from its current title of "planet," which it has held since 1930, to Kuiper belt object, a designation that some appear to feel is somewhat less exalted. Prof. Pullum's reader Adrian Morgan wrote to comment that those who object to the change in Pluto's status may share something in common with those who insist upon a rigid, prescriptivist approach to grammar: the desire to ensure that everything they learned in elementary school is correct, for all time. Prof. Pullum applauds the comparison, adding: "For people who want to make sure the material they were taught in elementary school and high school stays unchanged forever, the path is clear: stay away from all intellectual activity, avoid contact with anyone who is intellectually curious, live a dull and unexamined life." I couldn't agree more. When I was a physicist (in my previous life) among the aspects that always astonished and fascinated me about the field - and there were many - was how quickly our understanding of the universe could change at the margins; how swiftly the scientific truths taught to one generation became the quaint, antiquated models of the physical world to the next. When I was a young graduate student, a fellow student and I wandered into a lounge amongst the physics department offices and found a collection of old Ph.D. theses dating as far back as the 1950s. As we flipped through them, we were suprised to discover that problems in quantum perturbation theory that we were struggling with in our weekly homework assignments had been the thesis problems whose solutions earned doctorates for Julian Schwinger's students. That is not to say that we were smarter than Schwinger's students. Rather, physics had marched on such that what was the leading edge of applications of quantum mechanics at a time when not everyone was convinced that the theory was even correct had become so established as to be routinely assigned to students grinding through their introductory graduate courses. In the late 19th century, many scientists believed that they had figured out pretty much everything there was to know about physics. Only a few loose ends remained to be cleaned up, and then physics would be done. Those loose ends led to quantum mechanics and Einstein's special and general theories of relativity. As the collective human mind continues to contemplate the universe it finds itself in, wild new theories become accepted principles, and old theories must recede or be superceded to make room for them. If we aren't open to that possibility, we will close off nearly all areas of inquiry. And who knows what wonders we would miss out on? A few interesting items today on a couple of other blogs I sometimes read. Mark Liberman of Language Log writes a post that highlights the importance of the serial comma, which in my view is never optional. The reason why verifying a successful model is such a big deal is that the model itself - LambdaCDM with inflationary perturbations - is such an incredible extrapolation from everyday experience into the far reaches of space and time. When we're talking about inflation, we're dealing with the first 10-35 seconds in the history of the universe. 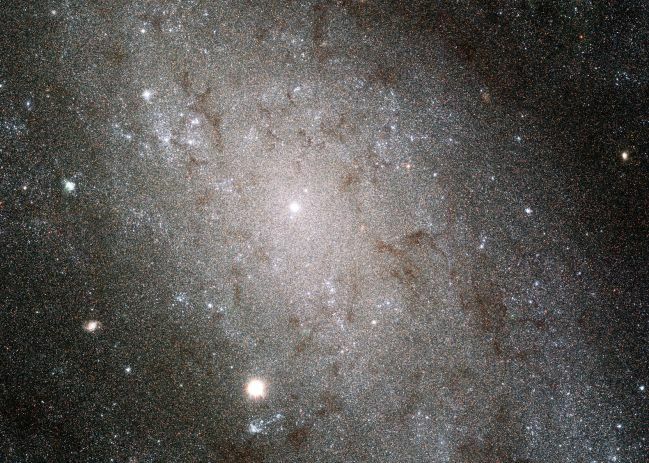 When we speak about dark matter and dark energy, we're dealing with substances that are completely outside the very successful Standard Model of particle physics. These are dramatic ideas that need to be tested over and over again, and we're going to keep looking for chinks in their armor until we're satisfied beyond any reasonable doubt that we're on the right track. I'm not fluent in Italian, which I usually notice when I can't come up with the word for, say, "doorknob", or when I have trouble with a sentence or find myself looking up words to make basic sense of a passage. Tonight I was looking at a recipe which called for cavatappi and I thought, "remove-corks" then "tire-bouchon" then "corkscrew" then "oh, corkscrew pasta". That's what not being fluent really means - even the stuff you know creates little eddies, increasing the impedence or Reynolds number of the language flowing through your brain. For me, a former physicist and language enthusiast, this metaphor is very apt. There is a turbulence, a randomness, to the flow of ideas and language through the brain. And there are multiple opportunities along the way for linguistic eddies to form and impede or garble the output. More on that another time. I've mentioned Astronomy Picture of the Day here before. Lately they have had some astonishingly beautiful pictures, and it seems like a good time to highlight their excellent site again. 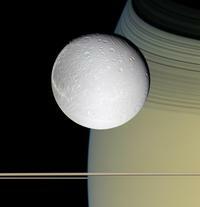 Last Friday's picture is a startling edge-on view of Saturn's rings accompanied by one of its small, icy moons. This image was taken by the Cassini spacecraft a couple of weeks ago as it passed through the plane of Saturn's rings on regular orbital path about the giant planet. 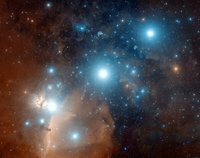 A few days earlier, APOD presented a gorgeous close-up of Orion's belt, three stars that are spotted easily in the winter skies even in the diffuse glow of Boston's light pollution. But they never look quite like they do here! MSNBC reports that Professor Elizabeth McCormack of my beloved alma mater, Bryn Mawr College, won a grant from NASA for further studies of her proposal to build a space-based telescope using an ultra-thin layer of laser-trapped atoms. More information about the project is here at Bryn Mawr's site. Unfortunately for me, Prof. McCormack did not join the faculty until after I graduated. I only met her once, when I returned to Bryn Mawr for a visit a few years later and gave a talk to some of the undergraduate majors about my research in graduate school. When she gave me a tour of her lab I was impressed with the work she was doing, and I am still, as I was then, excited and proud that Bryn Mawr physics continues to grow and improve. It's worth checking out the high-resolution version of this picture. 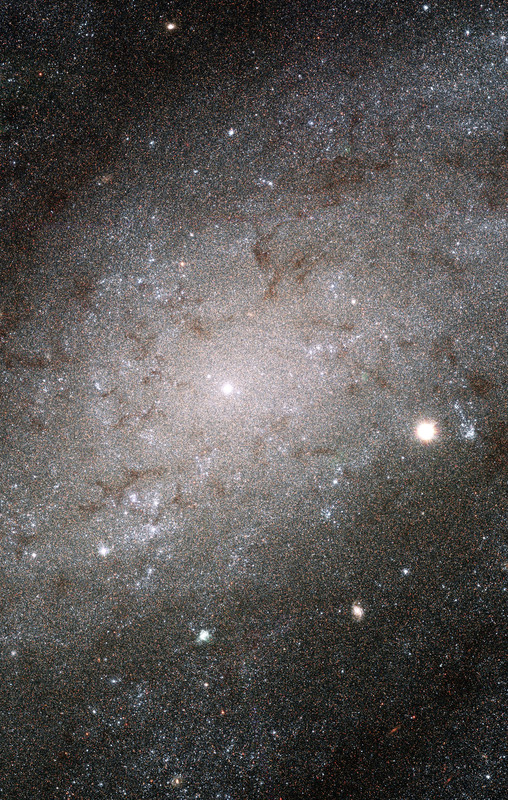 Those thousands of tiny dots are individual stars in another galaxy, millions of light-years away. Our best telescopes now cannot resolve the surface features of even a nearby star, but they can resolve the spaces between stars in neighboring galaxies, so that instead of appearing as diffuse smears of light, the individual pinpoints of starlight that comprise the galaxy may be detected. For some reason, nothing makes me feel as tiny as gazing into other galaxies.